Our Buckfast F1 mated queens are carefully bred from island mated stock we get from Denmark. 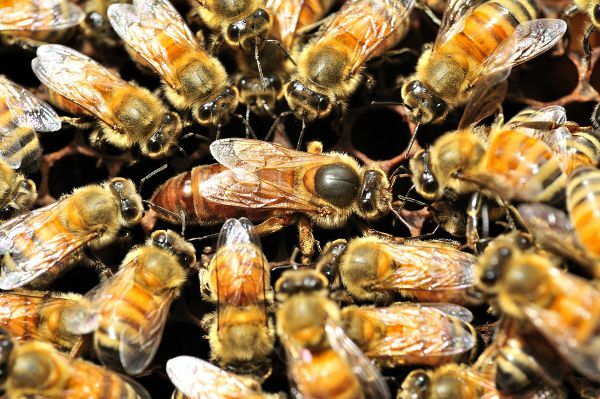 We take great care to raise these queens with excellent nutrition in healthy booming colonies and ensure that they are well placed to take the opportunities to mate with pure-bred Buckfast drones. We can only guarantee mating to F1 standard but we flood the area with pure Buckfast drones so a high proportion of our queens are in fact pure mated. We respect the welfare of our Bees so will ship marked in postal cages with attendants by courier, with next day delivery only. We offer a no quibble guarantee on temperament for all of those F1 mated queens we ship. We'd like to offer a 10% discount to anyone with sons and/or daughters in the Armed Forces; any member of Leeds Beekeepers Association; any staff at Pinderfields and Spire Hospitals, and Emergency Services personnel.